A couple of months ago I shared a free pack of film burns for use when editing videos. A number of people seemed to find them useful, so today I’m back with another free collection of video resources! 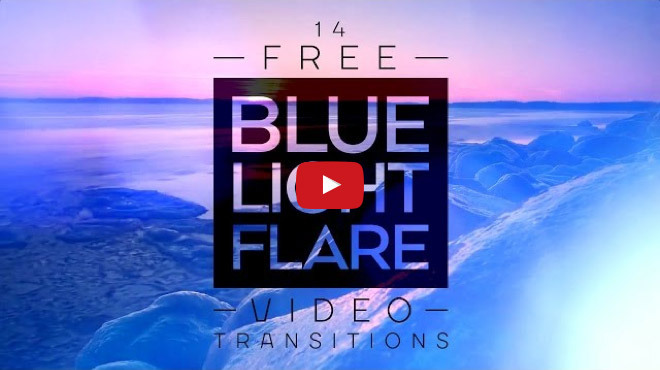 This pack of blue light flare transitions contains 14 short videos of bright flashes that help you create high-tech style transitions between your clips. Place them over your footage, then set the composite mode to Screen (or experiment with the other blending modes for different effects). Check out the preview video below to see them in action! This free pack of blue light flare transitions contains 14 1080p 60fps video clips between 1-3 seconds in length. There’s a mix of fast bright flashes and slower blue bokeh effects that creep into the frame to give you the choice between intense cuts and subtle colour casts. These aren’t specific for any particular editing app, they’re a series of videos that you can place into the timeline and overlay between your other clips. Set the blending or composite mode to Screen to render the black background transparent. These are terrific, man! I, personally, prefer the more opaque ones over the ones with the flash of white in them. The subtle transformation through bokeh, colored, even! Wow! Great job! This is amazing. The flare effect looks glamorous especially when put in a video I guess. It’s so nice how all the colors blend with each other. Thanks for sharing this one. Awesome …Thanks for this Chris..